Nuclear icebreakers have always been an important part of the economic survival of the Arctic Regions of Russia and a key element of the Northern Sea Route that unites Russia 's Atlantic and Pacific ports and that has been in regular use since WWII. NS Lenin is both the world's first nuclear powered surface ship and the first nuclear powered civilian vessel. Launched on December 5, 1957 the ship remained in service for 30 years in the Northern Sea Route, breaking ice for container ships to navigate. Icebreaker Lenin could open passages through 1.5 — 2 m thick ice, which was sufficient to make possible year-round navigation in the region. During that period, the icebreaker escorted a total of 3,741 transport ships. 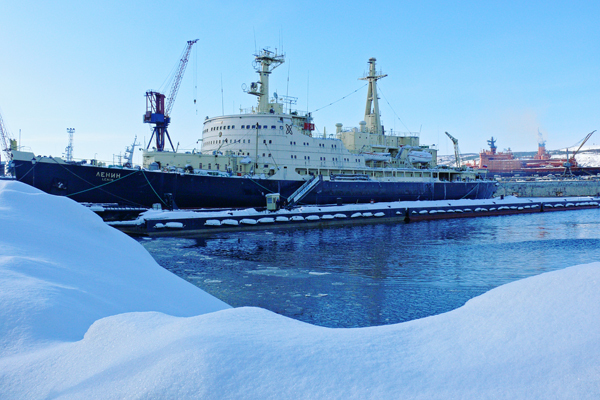 Today the icebreaker is moored to the Murmansk Ship Terminal for eternal anchorage and turned into a museum. We invite you for a guided tour on board the ship. A crew member will show you the captain 's bridge and the doctor 's room, you will have a chance to see the nuclear reactors and the engine system, sit on the commander 's chair and touch the steering wheel of the Soviet legend.